They way I look at Topics, sorry /Topics, is the BBC’s attempt to replicate Friend Feed. For those not in the know, Friend Feed allows you to follow a user and receive updates on everything they do on the web. The BBC has put two twists on this idea. Firstly, the updates are in fact news stories from the BBC’s News Website. So instead of seeing pictures of your sister’s cat, you’ll see that George Bush has invaded Mexico on a white stallion. The other notable difference is that all the updates come from a single source, the BBC. So while the service acts as an aggregator of information, it’s actually aggregating information that’s already held in one place. One of the interesting aspects of this service is that the BBC are effectively Judge, Jury and Executioner. They produce the news, and then decide which aspects of the news gets recorded against a Topic. I’m not sure what the planned longevity is of this service, or how permanent they intend the data to be. But the opportunity for the BBC to effectively write the history of a certain /Topic shouldn’t be looked on lightly. I’m also currently struggling to see why this has been separated out from the rest of the BBC site. 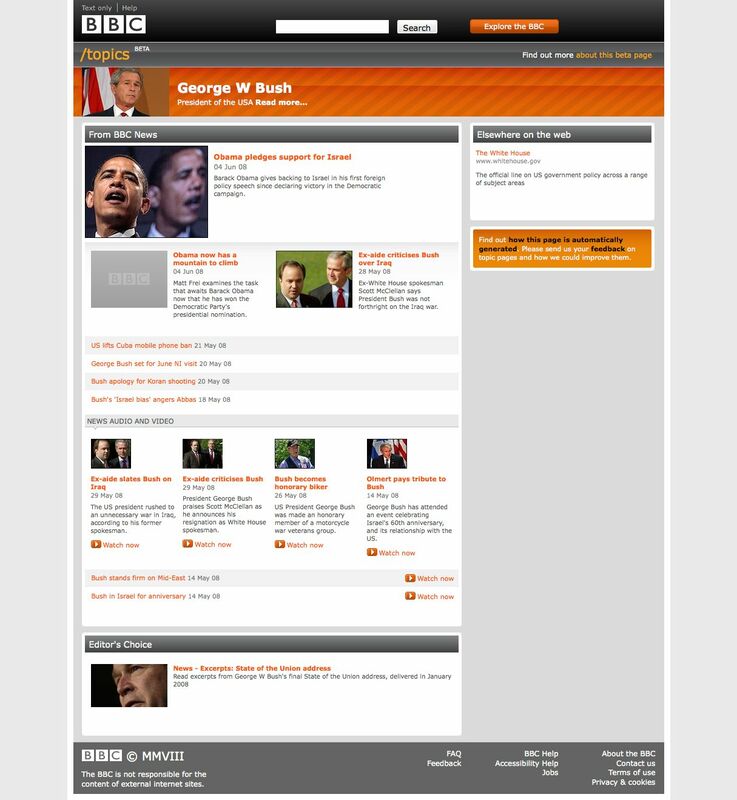 This service is surely something that would be best utilised tightly integrated into the BBC website. At the moment, it’s not integrated at all. If you view a Topic, for example Globalisation, and then read one of the stories, there’s no link back to the topic. I’m sure the real power of this facility is allowing users to further explain a topic introduced to them through a news story. I think they’re also missing an opportunity to define the topic. I certainly suggest that the BBC define the topic themselves, but a link or pertinent quote from a definitive source (e.g. Wikipedia) would greatly enhance the usefulness of the /Topic page. Something else that’s slightly confusing is the way the BBC classifies its News content. Looking at the front page you have stories sorted by physical location, as well as broad topic. Obviously there are significant overlaps between the two methods of classification, which aren’t really resolved or acknowledged. Throw into the mix this new, third way of classifying data and it may become a source of confusion. The BBC have to be very careful with the way they structure and promote this feature. At the moment, the accuracy and relevance of the stories returned in each /Topic are a bit hit and miss. Take the George W Bush page. It’s currently filled with stories about Barack Obama and general American Politics. No doubt this is due to the fact George Bush is mentioned in the stories, but they aren’t necessarily about him. So a clear definition of what each /Topic page is about, and what causes content to appear on those pages, is needed. For a service like this to be truly useful, the results have to be predictable in so much as you aren’t surprised to see something appear because it’s not in line with the rest of the content. A distinction needs to be made between stories about the topic and stories that involve or affect the topic. All in all, it looks promising. It’s quite obvious the service is in beta, the lack of Topics and integration belie this. I think the biggest step in it’s progression will be a clearly defined purpose and vision. As I touched on above, the question of what a topic page is needs to be answered, and it needs to be answered publicly so people know whether it’s something they can actually use. It will be really interesting to see how this service develops.